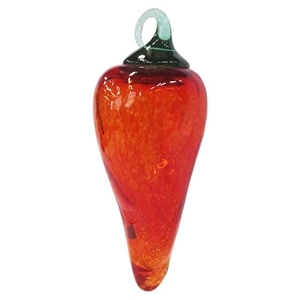 This handmade glass blown ornament was made by the Glass Eye Studio in Seattle, Washington. Chili peppers are used in many cuisines around the globe with hundreds of different colors, sizes, and heat intensities. Glass Eye Studio is so taken by the beauty of these culinary icons that they have chosen to express in the timeless vibrancy of glass. Approximately 3 1/2" long and 1 5/8" wide. Handmade ornament may vary slightly from the photo.